Laela Earring Angel © Earring Holder Organizer and Necklace Stand. Click on the Angelynn's Jewelry Organizers link above product title to see more of our jewelry storage solutions. Handmade product 100% Made in the USA using skilled American tradesmen and high grade US materials. We use carbon steel and the very best baked on powdercoat finishes, no mystery metals or lead. We are a small boutique company and do not mass produce but instead offer smaller quantities with higher quality. Jewelry Holder Dimensions: Quite large at 16 1/4 inches tall x 17 1/2 inches wide x 5 inches deep. The large oval weighted steel base/accessory tray measures 15 inches x 5 inches and has quality felt pads to help protect your furniture. 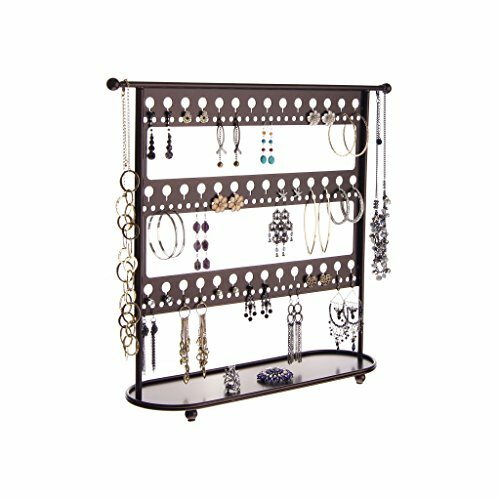 Earring holder, jewelry organizer and necklace stand storage capacity: Displays 63 pairs of large earrings. Top row accommodates 2 1/2 inches (*lengths/diameters), middle row *3 inches, bottom row *4 inches, but also holds stud earrings in any keyhole. There are 2 top end knobs for necklaces up to 30" long.